Trailing Flowers was the first Bake ‘N’ Carry. Each Bake ‘N’ Carry came with a snap-on quilted cozy. Trailing Flowers was part of the Hospitality Collection. Trailing Flowers is also known as "Sprig." By the time the new Bake ‘N’ Carry was released in 1980 as part of the Hospitality Collection consumer interest in opal Pyrex ware had decreased. As of 1980 fewer opalware products were being produced. Bake ‘N’ Carries were released in several patterns, the first of which is unofficially known as “Trailing Flowers.” It was also given the nickname, "Sprig." Trailing Flowers was released on the 1 ½ and 2 ½ Round Casserole (474, 475). 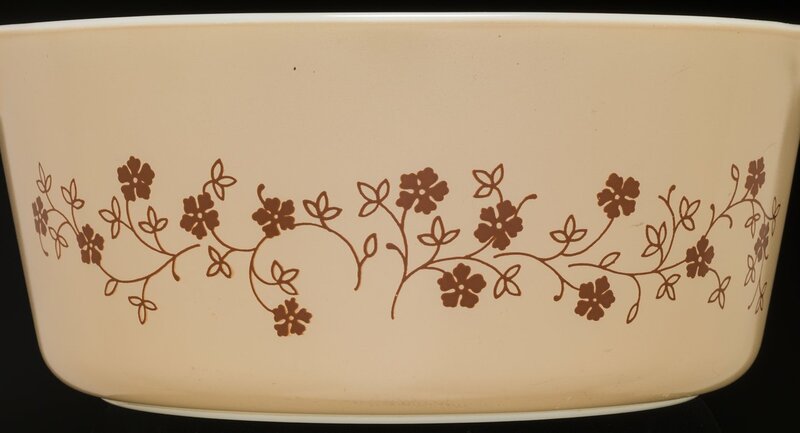 The 474 casserole was red with a pattern of white flowers and vines. The 475 casserole was beige with the same pattern in red. Both casseroles came with a quilted snap-on cozy, meant to make carrying a hot dish easier.